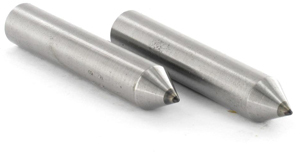 We can supply both standard chisel/cone diamond tools as well as offer tools to customer's specifications including special angles, radius and shank sizes. We offer straight shank chisel and cones as well as phonopoints. 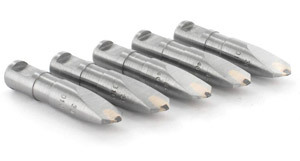 Chisel Diamond Tools are available in straight, headed and diaform style shanks. Diaform Chisels are available in both short and long series shanks. On most diaform machines two dressers are set up for use in tandem and both can be replaced or interchanged very easily. Mounted adjacent to each other either the roughing, semi finishing and finishing chisels can be set up together. Both chisels are inclined at an angle of 5 degrees to the wheel centreline at the point of contact, providing the ideal cutting conditions. Various angles and radius are available. Chisel Tools are used to form accurate profiles on grinding wheels. Also for radius dressing, gear grinders and thread grinders. A larger radius is generally used for roughing larger radius, and a smaller radius for finishing or producing a smaller radius. These are elongated diamonds cut to a conical shape with an included angle and radius on the point. Steeper angles are more fragile, wear faster and break easier than larger angles. These tools are mainly used for step, form and radius dressing. Cone diamonds are primarily used to finish dress a thread grinding wheel, which requires a radius on some point.